I am dedicated to the path of "The Great Unknowing", a process of unfolding given to me by my Spirits, a path of profound mystical development. Through shamanic practice coupled with increasingly refined intent, we can learn to relinquish our perceptual positions, agendas, belief systems, and strivings. We learn to truly nourish the core of our being, and we open to the pure potential of Spirit to act in our lives. As we call upon our Helping Spirits to guide us, we enter into a world where ordinary rules cease to bind us, and where we can find freedom from precepts that have constrained us previously in our lives. As we explore our own natures as sovereign beings of Spirit, we become increasingly able to claim the birthright of our own sacred gifts, and to create our world anew, with the light of spirit as our guide. As a dedicated seeker on the path of true sovereignty, I revel in each individual's capacity to access our own authentic authority and instinctive ways of knowing, and feel that it is vital that we act to cut the ties to the imposition of traditional hierarchical structures, that by their very nature, for their own survival, seek to limit each, our own capacity for full actualization in our lives. While I feel that training and the distribution of information may have their place in helping each seeker to find our way, and to build confidence in our own authority, it is the individual's own instincts that must be cultivated, honed, and heeded in the pursuit of true sovereignty of spirit. Gail Gulick has been a lifelong explorer of the vast resources available to us in the unseen worlds. Her life experience encompasses the myriad states of the human condition, bringing a great depth to her perspective as a teacher and a healer. She is committed to helping others to find a greater sense of connection, peace and wonder in their lives, to lovingly embrace all aspects of their nature as human beings, and to nurture caring and attentive relationships with the worlds around us. Since 2006, Gail has held weekly shamanic journey circles dedicated to deepening our relationships with spirit, strengthening one's own sense of sovereignty and presence, and exploring our own true natures in the most loving environment possible. Each circle is a cultivation of loving community in which we can engage with the most meaningful aspects of our lives. Gail has been a Shamanic Mask-Maker since 1989 and a workshop leader since 1995. She is a graduate of Sandra Ingerman's Two Year Teacher Training and Tom Cowan's Two Year Training in Celtic Shamanism. 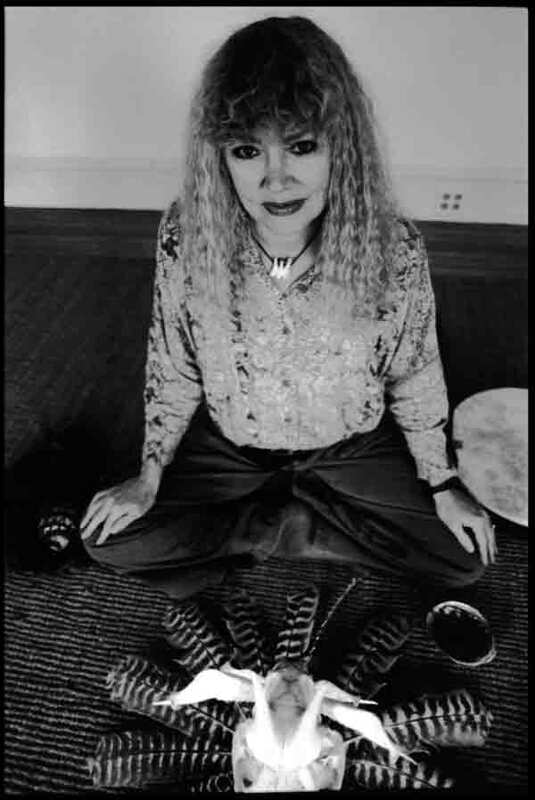 She has studied Core Shamanism in depth with Nan Moss and David Corbin, and Sandra Harner and has taken focused Shamanic trainings with Betsy Bergstrom, and Hank Wesselman, among other shamanic teachers. Gail was also a four year resident of Kripalu Yoga Center. Gail's healing practice and leadership are informed by her own life-long pursuit of mystical experience, of which her shamanic training experience is one aspect. Her shamanic practice is aligned with her own pursuit of sovereign authenticity in action, and cannot be philosophically contained within any specific lineage. Gail holds shamanic trainings in Celtic shamanism, shamanic healing, Medicine for the Earth, and shamanic journeying. She also offers one-on-one and remote shamanic healing sessions that include Soul Retrieval, Power Animal Retrieval, Shamanic Extraction, Compassionate Deposession, Psychopomp and Space Clearings, Transition Support, Ancestral Healing, and Faerie Doctoring, among other Spirit-Driven modalities. She also offers journey experiences through weekly shamanic journey circles, as well as life-mask-casting experiences for groups or individuals. Please see Whispers of the Heart for more on Gail's perspective. "As a spiritual seeker I have spent my life practicing, exploring and investigating various techniques, teachers and modalities. Lucky for me I found a profound Shamanic teacher, Gail Gulick, who has taken me into realms, worlds and understandings that have changed my life and dramatically expanded my perspective on reality - thank heaven! Actually, the thanks also go to Gail who is a most profound guide into the mystery of life. I have been in her Shamanic Circle for ten years, where, with Gail's guidance I have had experiences, openings and revelations that enrich my life like nothing else." "Gail is an inspiration to me as a teacher, a master at holding space for each person to do/experience/learn what THEY need to learn, giving enough structure but not too much. There can be a dozen people all at different levels in their experience and personal healing and everyone gets what they need at the moment and nobody is left behind. All are encouraged. That is different from teaching the methods and traditions that Gail has learned. I come for the former, not the latter." "Gail is a kind and gentle positive leader who respects all and has a great sense of humor!! Do yourselves a favor by attending anything she offers as he will be rewarded with insight, community and joy!!!" "I cannot impress upon you enough how truly happy I am. I am truly happy and at peace for the first time in my life. You have made this possible in a very direct way. Thank you for making this experience possible." "Thank you so much for the wonderful journeying session last Wednesday. You are such an incredible spirit and it did my heart good to be in the presence of you and all the other beautiful souls drawn to your loving wise energy...Thank you so much for the abundant gifts you all showered on me. I feel I have found home. Our circle made me feel safe to go deeper. I am so honored to be a part of your sacred space. When I was driving home I reflected that in this amazing environment you have created with such sweet and meaningful intentions, we all truly see one another instantly and deeply. I feel I have known you lifetimes and we only just met. It is so refreshing to connect on this plane. This is the most amazing circle I have ever been a part of."